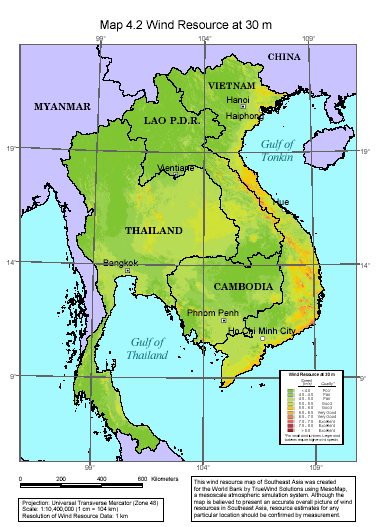 Most of Cambodia’s regions have an average wind velocity of under 3 m/s, and as a whole the wind conditions are not very favorable but there is hope for those few areas with an average wind velocity of over 5 m/s. Windmill generation of electricity should be started when wind velocities are around 3 m/s and under, it can be said that wind power generation is an suitable power generation in most of Cambodia. 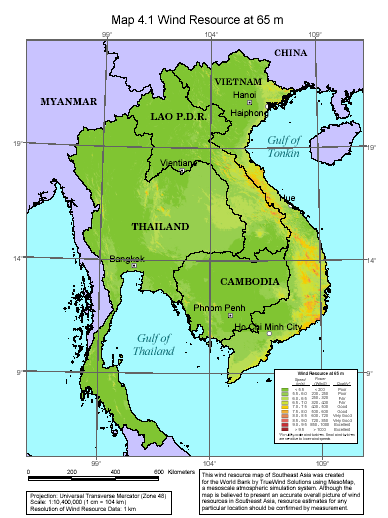 However, the southern Tonle Sap lake region located in central Cambodia, the mountain area in the southwest, and the southern coastal areas have favorable wind condition. 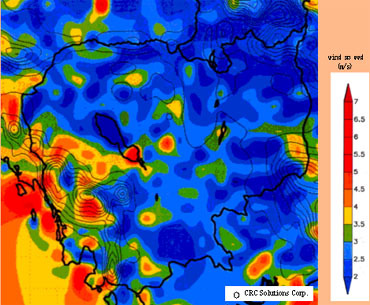 Sihanoukville has an annual average wind velocity of around 5 m/s, which corresponds to the results of the simulation well.